Mark Jeffers vowed to keep on learning after coming through an awkward test to remain unbeaten in Bolton on Friday night. The Eccleston middleweight moved to 8-0 as a professional with a six-round points win over Edgars Sniedze on MTK Global’s big card at the Macron Stadium. The 20-year-old was too skilful for the Latvian who, standing at 6’2” tall, didn’t make life easy for the Jennings Gym prospect. Jeffers kept his composure though, Sniedze having a point taken off by referee John Latham for persistent fouling, as he got the nod 59-54 on the official’s card. “He had a horrible style,” said Jeffers, trained by Michael and Dave Jennings in Coppull. “He was pretty tall with a long reach so I was just trying to work inside. “But every time I got in, he was holding, tying me up, I think there was even a headbutt in there. “I’m 8-0 but there’s still loads to work on. “I’m still young so I’ll go back to the gym and we’ll look at where we can improve. It was certainly a fight to bank for down the line with Jeffers acknowledging that he could have tried different things to break down his durable opponent who has shared the ring with several of the country’s top prospects. “I couldn’t put as much of the stuff we’d been working on into practice as I would have liked,” he said. “Mick told me to work inside after the first round or two and it was tough. No date is set for the prospect’s next outing with a rest now on the agenda after two fights in relatively quick succession, Jeffers having picked up a first career stoppage at the same venue back in May. Taking it east isn’t necessarily the Eccleston man’s strongest suit though. 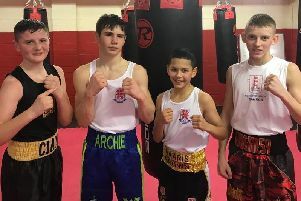 “Mick wants me to have a little rest now,” said Jeffers, who shares a gym with British cruiserweight champion Matty Askin and Preston prospect Scott Fitzgerald amongst others. “I didn’t have much off a rest after the last one and that maybe showed in there, maybe not. It is what it is. “I’ll have a week or two off, have a watch of that and see where I can improve and go from there. “I just want to improve all the time but maybe sometimes I just need to slow it down and take that rest. A packed card in Bolton should have been headlined by popular Liverpool heavyweight David Price only for the Olympian to pull out late in the day with a back injury. The night’s action didn’t disappoint however with Matthew Wigglesworth getting the better of Ben Sheedy in the main event as the Yorkshireman lifted the Central Area middleweight title after a thrilling 10-round battle.